after a bit of a false start my new computer is here and going. Not sure that I would order another computer from dell though. Was NOT impressed with the lack of customer service in regards to the actual delivery…seems it is against their policy to call business clients (ordered it through top50) to advise of delivery dates (despite allowing them to request a call) so it took me 2hrs to try to chase it up when they tried to deliver it on Monday (which mind you was bloody fast as I only ordered it on Wednesday)! anyway it’s here and i LOVE it. I didn’t realise just how much I missed my old soft touch keyboard til I got this one out again – it just makes you want to type all day I love it, it just FEELS right! AND I have to say that 17″ flatscreen is AWESOME (compared to my 15″ crt) just lovin it….espeically now that the modem driver is updated and it has stopped crashing every 5 minutes! I spent most of the afternoon with Owen assembling my filing cabinet (flatpacked timber four draw filing cabinet on clearance at kmart for $60 – BARGAIN)! It took forever but the little boys – Corey and Brett were BOTH sleeping woohooo! Anyway the big reason for doing that was so I could move the printer onto that and have room to set up a second computer on the desk. Ironically we had always planned to put two on the desk and network them…but that is not to be….in fact ex is moving out on Monday week. This is great news simply because then everything will settle down and we can all get on with our new lives and look to the future. So tomorrow I am off to the supermarket for wipes and nightime undies and then back home to finish sorting out the computer I think! Still need to get some software sorted out etc etc and of course the housework beacons as do the boys. I got heaps of top50 stuff caught up on in the last couple of days too so that’s great. You know what? I am lovin my life atm. Yes there are some things I could change in a heartbeat if I could (first and formost would wave my magic wand and make Dad all better) but I guess some things can’t be done and we have to do the best we can with what we have. My little angels are beautiful. Owen has been quite sooky which drives me up the wall a bit but on the whole he is making so many gains…today I was even told that he does get up and participate in show and tell at daycare even though he never has much to actually say. Brett has been a right little horror quite a bit but I guess that is the 2yr old in him testing boundries. He is still unfairly cute and can get away with more than he should…sadly he is cute and HE KNOWS IT! I love watching them play. I am totally amazed by both the boys imaginations – their imaginative play skills are probably at about the same level now so I constantly have to think fast. Owen was turning daddy into a chicken and a pig while I was feeding Corey the other day with a magic wand that came with a sample of some cream or other in a bounty bag. He turned it on Brett and tried to turn him into a chicken but it wasn’t working (me knowing that Brett has been a ‘kitty cat’ for the past month) suggested he turn him into a cat – wow it worked! two happy boys! And corey my angel baby is SIX months old! Wow how did that happen. Maternal health still a bit concerned about his weight but as he is happy and doing most of the right things I’m not to worried about it (yet) but still trying to get him to attempt ‘solids’ with little success so far….also been slack and he still is yet to have his 4 month old shots – going to try to get that done this afternoon if i can! And me….you know what…I bought a SKIRT…yep a girly thing! I’m sure my Gran would be looking down and smiling! Well I got it home and thought now what does one wear with a purple skirt…..so today I went out shopping and didn’t find much so in despiration went into millers – (nearly didn’t as i looked in and say about 6-7 grey haired ladies and thought maybe i was too young to shop there lol) but I went in and I found a pink top a purple top and a gorgeous ORANGE top and you know what – they were all on 1/2 price specials (or more) and so only cost my about $30 for the THREE of them!…..kmart have a shoe sale starting tomorrow so off to get some shoes to go with it then i think….unless i can wear my brown boots with a purple skirt but suspect i really need black ones………..omg i’m turning into a girly girl! So does anyone want to see me dye my hair BRIGHT purple? wow when did it get to be Easter already – that one totally crept up on me! well I have consulted with the Easter Bunny about the boys and I’ve got some things to make some things for people – but not many people are getting easter eggs etc from me this year. Have spoken with Steve and while he isn’t jumping with joy about spending easter alone he isn’t arguing so I am going to take the kids to Aunty Sues (after an easter egg hunt at home of course). Will be nice to take the car for a spin…really must put a bit of petrol in it before I pick the kids up from daycare or won’t be going anywhere! He is looking at a unit at 5pm today so hopefully all goes well there and he will have his new place sorted out asap – it is empty now so here’s hoping that he can move in fairly soon although this weekend won’t happen I imagine as could be problems with getting electrity etc hooked up in time with all the public holidays. I am going to miss this PC til I get a new one sorted….but have the old one here so will still be online. Dad’s surgery is the 23rd May – that’s a bit further away than we would have liked but hopefully he will take it easy and not worry too much before then and all will go well. Its a gorgeous Autumn day again today. Tomorrow we have playgroup. I will have to leave playgroup early though to get to kinder at 12 for Owen’s Easter Bonnet parade. Hope it isn’t too warm tomorrow as really want to dress Corey in his easter bunny suit – but oh well I bought him new clothes to go with his orange boots today so he has a cute back up outfit if need be lol! the paper trail is slowly being sorted out now and all is right with the world. ok so I’m happy. I am, REALLY….I haven’t been this happy in a long time and I’m ready to get on with my life. So he is less than happy about moving out and not being able to do things like put the kids to bed….well sorry but that’s just the way it is. I’m not living in a sham of a loveless marriage for the rest of my life….I’m happy. Will be happier when we can all get on with life…..
so It has started,…. you can have the tv but I’m keeping the lounge, yes you can have the computer but not the modem, printer or scanner……blah blah blah – all good so far – no arguements…. But man who would have thought that two lives twined together financially would be so bloody hard to untangle! Centrelink want a BOOK from each of us to prove that we are really separated and not just having a bit of a spat….plan to take that back to them tomorrow while the boys are at daycare. Optus was meant to change the phone contracts around (mine was in his name and vice versa – dont’ ask) but instead they put the two on ONE account! arghhh thankfully the assistant manager at the local store was VERY helpful and has it in hand though he tells me it may take a few days. And so it goes on, insurance, electricity etc etc etc…..ah well will be great to be responsible for my own things and if I overspend I will have no one to blame but myself! Am thinking of my Dad tonight – he sees the heart surgeon tomorrow in regards to his very urgent bypass surgery. Am hoping and praying that all goes well there and that he doesn’t have to wait too long (figuring some things are best done before you have too much time to stress and worry over them). – buy an orange top for Corey (he has the cutest Orange shoes we saw at the market but apparently nothing to wear with them)! – look at a couple of units for steve – he asked nice and frankly if it helps move things along faster seems like it is worth my time. and if I get time – work on my a-z album – running out of time! oh and more top50 bookwork. So don’t I sound super organised?! oh and did i mention that it was just a beautiful day here today – sun was shining, birds were singing and best of all – kids were playing nicely together! AND it occured to me that I left unattended a glass of coke zero for a full 20 minutes and kids didn’t touch it. They have not helped themselves to choc yoghurt (i refused to buy any for the last 6 months because they scoffed about 8 one morning before i heard them awake) or the biscuits either – in fact they have generally been staying out of the cupboards almost like well behaved children! And while on that subject – we have been eating dinner together at the kitchen table too at the boys insistance which is just GREAT! onwards and upwards I say……life may not be the party you hoped for but while we are here we might as well dance! 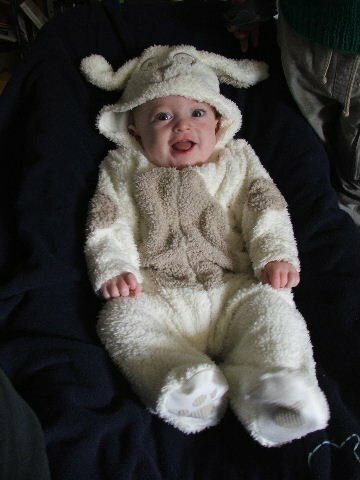 ok so I just couldn’t resist buying a silly little bunny suit for Corey – my others have never had bunny suits but it was sooooo soft and cute….and it certainly makes him look a lot bigger than he really is too…. thought i’d share him with the world cause I think he is adorable. Firstly a big thanks to everyone who emailed me here or privately….I’m a big girl and I made my decision and can look after myself – but I really appreciate knowing I have so many friends willing to lend an ear or a hand. In the last couple of weeks though I have killed two spiders all by myself, changed a lightbulb and bought myself a car! Time to learn to look after myself and be more independant. Just got my new (old) car today and I love it – if only I could purple it up a bit – as just white is a bit well come on white commodore wagon – doens’t exactly stand out now does it?! but for now it is just toooo bloody cold here in my scraproom for any kind of scrapping so I’m off to bed with a book! Playgroup tomorrow – first time in my new car – woohoo!